Our Infrastructure. Your Profit. Infrastructure as a Service (IaaS) is a provision model that supports your business with on-demand access to enterprise-class infrastructures and IT resources including storages, hardware, servers and networking components. Infrastructure as a Service (IaaS) supports your business with on-demand access to enterprise-class infrastructure and IT resources such as storage, hardware, servers and networking components. … reduce the cost of administration and personnel associated with housing, operating and maintaining your IT systems. You can improve cost efficiency and productivity while keeping pace with your growing IT needs. 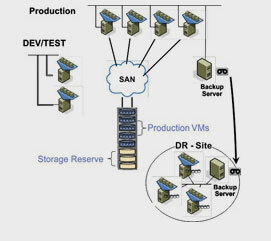 …exploit virtualization technology to reduce your investment in hardware and server consolidation. …lower the total cost of ownership of your email and collaboration platform. …rely on IT at Once’s built-in monitoring and centralized control to deliver scalable, secure solutions that simplify the management of all your licenses, system maintenance schedules and upgrades. …automate system management tasks such as security, patch updates, asset and configuration management. …manage your IT environment from anywhere, anytime, with our intuitive web-based tools.